The ability and intelligence of well-bred and well trained gundogs is remarkable. 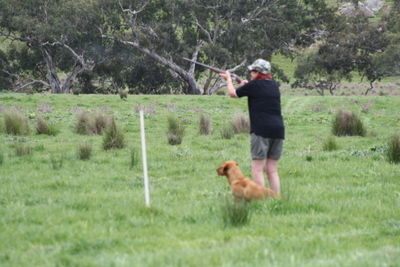 DOGS Victoria and various affiliated clubs conduct competitive trials in the field for registered gundogs. These events are designed to test the various breeds in the type of work for which they were developed over hundreds of and even thousands of years. They provide breeders with the opportunity to test the natural working instincts of their dogs and therefore the chance to select breeding stock on the basis of appropriate temperament and for preservation of their invaluable working instincts. These trials provide the opportunity for owners to experience the pleasure of working closely with their dogs in a fascinating range of competitive field sports. Retrieving trials are competitions using registered purebred Gundogs (eg Labrador Retrievers, Golden Retrievers and German Short-haired Pointers etc) where dogs are tested for obedience, and natural retrieving and hunting abilities. 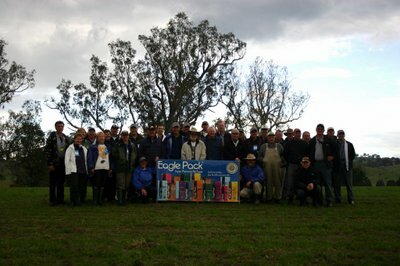 The trials are held on properties throughout Victoria and are set in areas that can as close as possible imitate natural hunting situations. 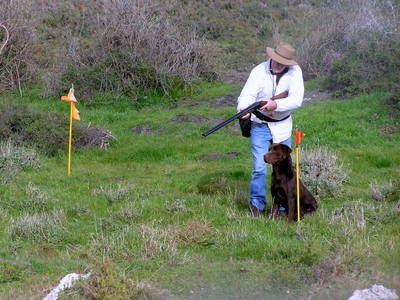 The purpose of a retrieving trial is to test and determine the dog’s natural hunting ability in the field, under natural conditions. Items to be retrieved are cast from a mechanical thrower and dogs must be able to determine the depth of the fall of the ‘game’ and then be able to hunt out the game, retrieve it and gently deliver it to the handler. 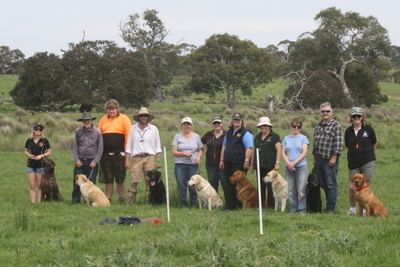 All retrieving trials are held under the rules and regulations of the ANKC (Australian National Kennel Council), and are held in all states around Australia. All dogs entered must be over six months of age and trials are conducted by various Gundog Clubs during the year. 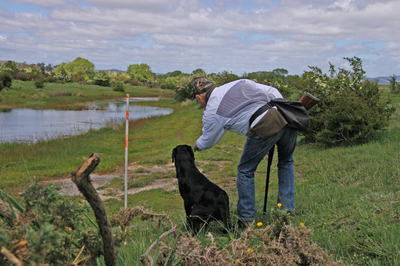 Retrieving trials are conducted at five different levels, beginners, novice, restricted, all age and championship. Beginners is the entrance level for new trailers. A beginners test is a test for dogs that have not previously won a beginners test or been placed in any other retrieving trial stake. A beginners test consists of two runs (retrieves), one on land and one in or through water which is of sufficient depth for the dog to swim. Beginners handlers are generally given instruction on the procedure for the conduct of the test and shown the mechanics of the run over which the dog is required to compete. It is a great way to be introduced to the sport of retrieving trials. On the opposite end of the scale are the championship stakes. One championship stake is conducted in each state in Australia each year. The one exception is the year the National Retrieving Trial Championship is conducted in the state, which is held in addition to the state championship. A national championship has to consist of at least seven retrieves with at least 15 items of game two of which have to be blind finds where the dog has to be tested for steadiness from behind a hide. Championships are a great spectacle of working gundogs and generally attract many competitors from other states. 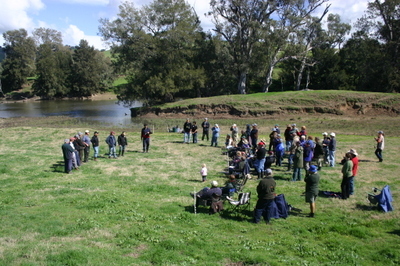 The RATG is open to both registered and associate gundogs. It is a test of basic retrieving ability. The tests are designed so that they might be held at either obedience trials or perhaps show events depending on the area that is available. Titles are awarded at two levels; novice retrieving ability (NRA) and open retriever ability (ORA). Novice level consists of four exercises; walking to heel, a recall, and two single mark retrieves. Open level also consists of four exercises; walking to heel, one minute stay with recall (incorporating a stop on command), walk-up retrieve, and either a double mark retrieve or a double rise retrieve. There are may other Sports you can get involved in with your dog such as Obedience, Field Trials,Tracking, Agility, Dances with Dogs,Track and Search, Rally O these are just some of the disciplines, visit Dogs Victoria’s web site to find out Moore.